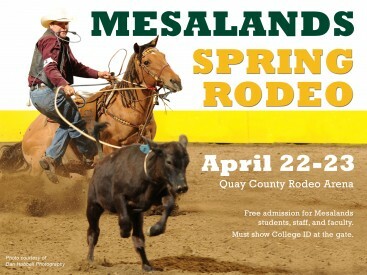 Join us for the Mesalands Community College Spring Rodeo Weekend on April 21-23, 2016. The celebration will begin with the Stampede Fiesta on Thursday, April 21 from 5:30-8:30 pm at the North American Wind Research and Training Center. April 22-23, 2016 at the Quay County Rodeo Arena. Events will start on Friday at 6:00 pm for the first Rodeo Performance. On Saturday Slack begins at 9:00 am. There is no cost attend Slack. The Championship Performance begins at 6:00 pm. Tickets are $5, free for children under the age of 12 (accompanied by a paying adult), and seniors 55 and over are $2. Photo courtesy of Dan Hubbell Photography.